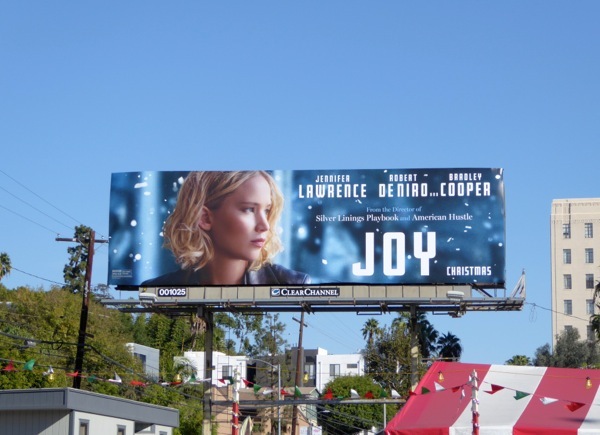 In a far cry from The Hunger Games finale in November, Jennifer Lawrence is back on the big screen this Christmas in Joy, to play the woman who invented and personally marketed the Miracle Mop on QVC. 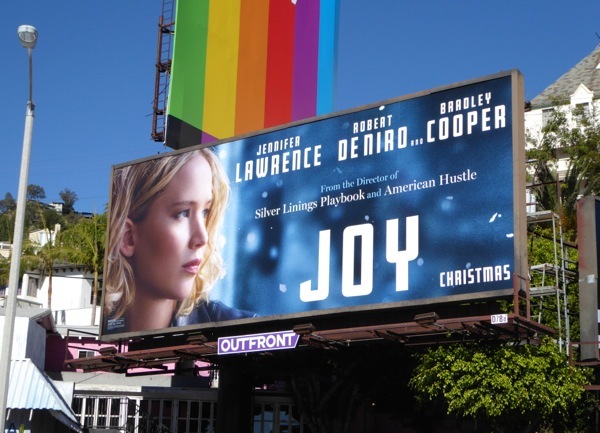 She plays housewife-turned-entrepreneur 'Joy Mangano' in the third David O. Russell movie in a row to feature her talents, she won the Best Actress Oscar for 2012's Silver Linings Playbook and garnered a Supporting Actress Academy Award nomination for American Hustle last year. 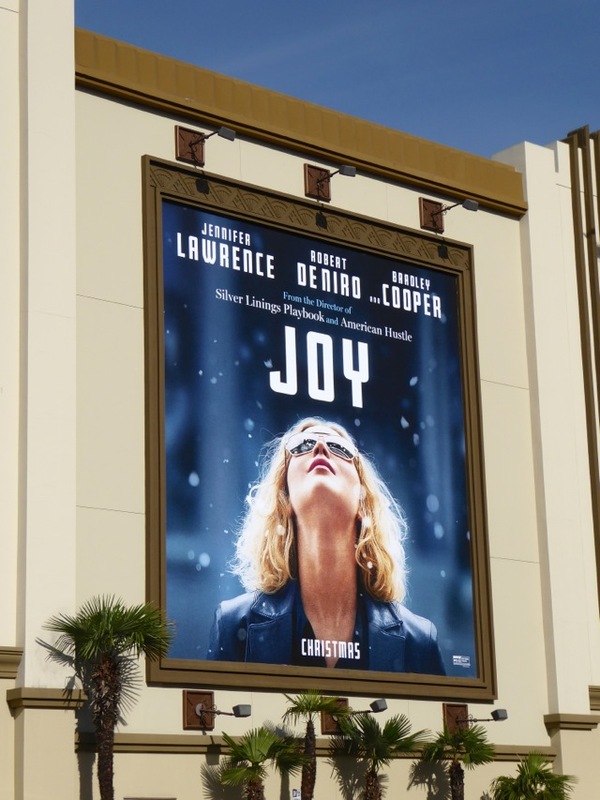 Based on true events and once again co-starring Robert De Niro (as Joy's father) and Bradley Cooper (as a QVC executive), the film follows the roller-coaster life of Joy and her Italian-American family through marriage, divorce, children and her determined rise to business success thanks to her self-wringing mop. 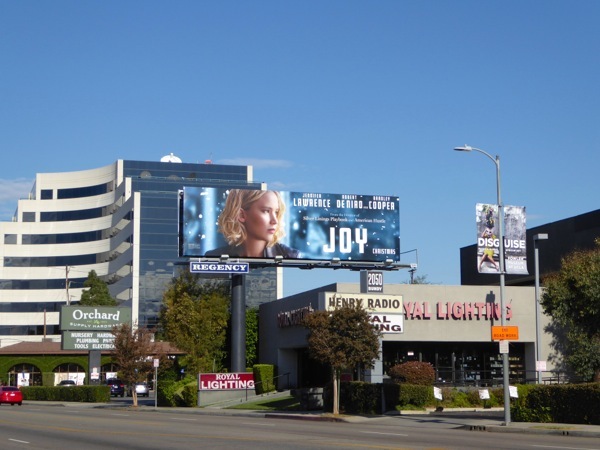 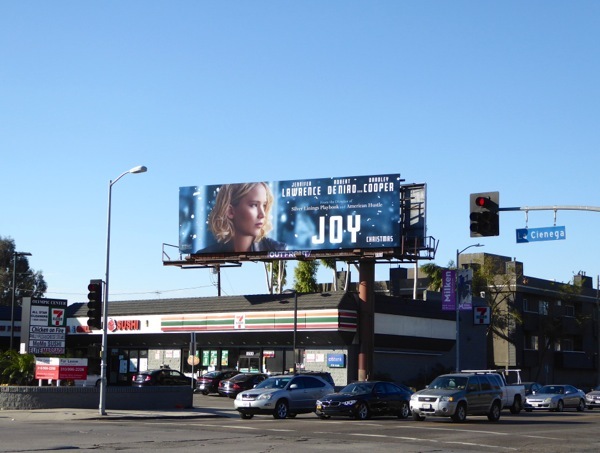 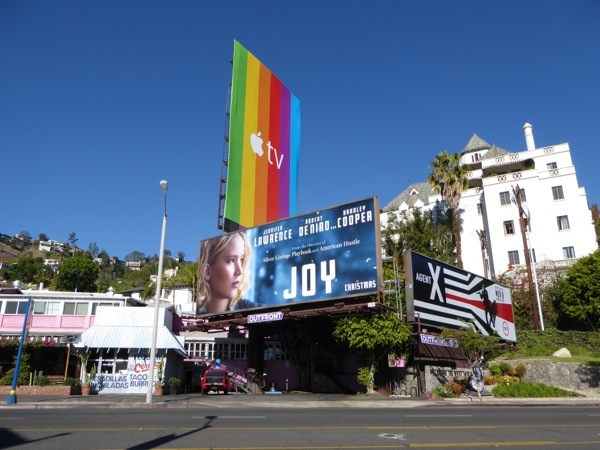 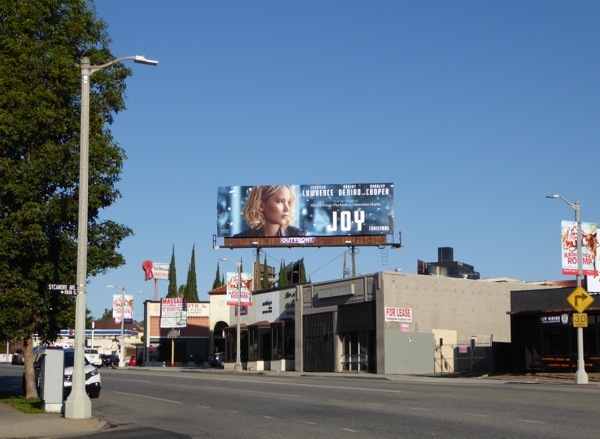 These billboards for Joy were first spied along Bundy Drive on November 27, then later along La Brea Avenue, La Cienega Boulevard, Highland Avenue, Olympic Boulevard and the Sunset Strip through December 2, 2015. 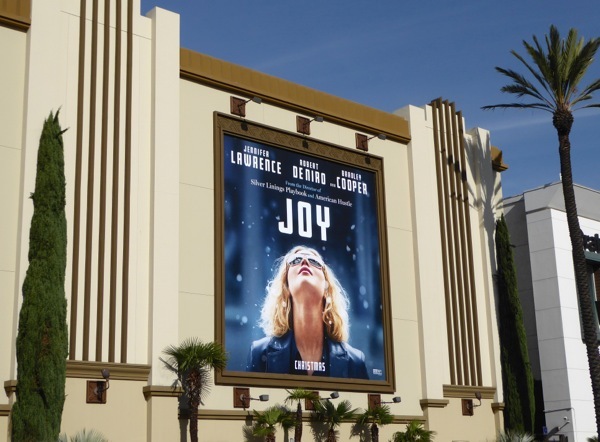 If you like the sound of this quirky comedy drama, be sure to also take a look at all these original film costumes designed by Michael Wilkinson for Joy on display at cinemas in L.A.
Plus if you're a fan of the accomplished actress, you can also check her out in these billboards for The Hunger Games movies, these American Hustle film billboards and these X-Men: Days of Future Past movie billboards. 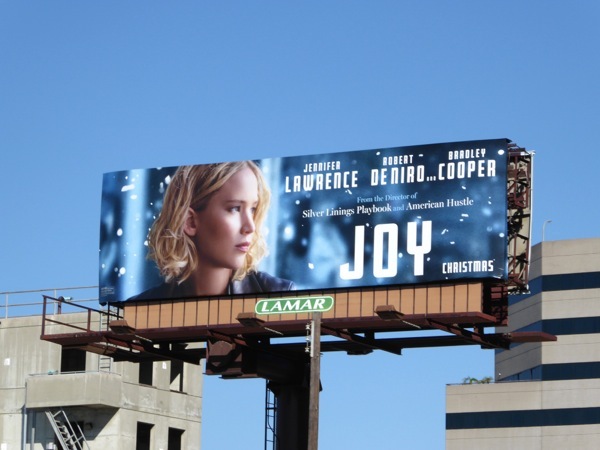 Let's hope we'll all be feeling the joy this festive season. 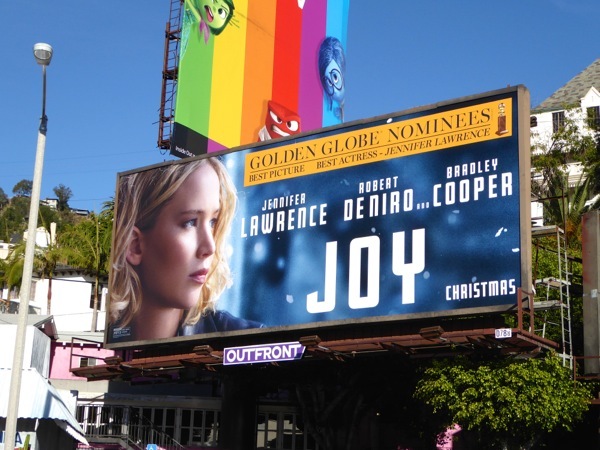 UPDATED: David O. Russell's Joy has been receiving dire reviews from critics, so it's not wonder the studio has been quick to slap the film's Golden Globe nominations onto its outdoor advertising to help the movie. 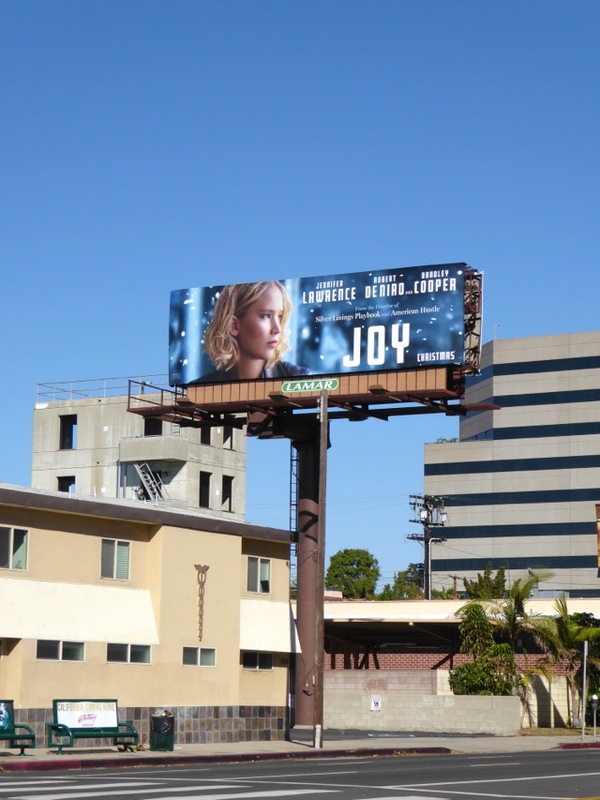 This Golden Globe Nominees Joy billboard was snapped along the Sunset Strip on December 16, 2015.